"Sampath Speaking" - the thoughts of an Insurer from Thiruvallikkeni: Railway price hike .... to me, it appears reasonable .. ! Railway price hike .... to me, it appears reasonable .. ! Indian Railways, Government and Railways Minister D V Sadananda Gowda – in news …… one newspaper reported that the Minister is pushing to make the Indian Railways go green. For the first time in India, solar energy will be used to power the trains and about 30 coaches of DEMUs (Diesel Electric Multiple Units) deployed as local trains around Delhi will be fitted with solar panels. The `7-crore pilot project will test if solar power can be used for train-lighting and meeting the auxiliary power needs. The project is not just environment-friendly but, if successful, can be a game-changer for the loss-making mass carrier. The one that is creating ripples is the steep price hike in rail passenger and freight fares - the first dose of the "bitter medicine" Prime Minister Narendra Modi has warned to revive the economy. India's railway network is one of the world's largest, but years of low investment and populist policies to subsidise fares at affordable levels have crimped growth in new lines and hindered private investment. From June 25, rail passenger fares will increase by 14.2 percent and freight rates by 6.5 percent, the railways ministry said in a statement. The last fare hike was in October 2013. It sure would impact many of us…. For my travel from Triplicane to Kasturibai nagar (ticket valid from Chennai Beach to Velachery – the price is Rs.5) and the monthly season costs Rs.105/- - that is set to go up by a huge percentage. 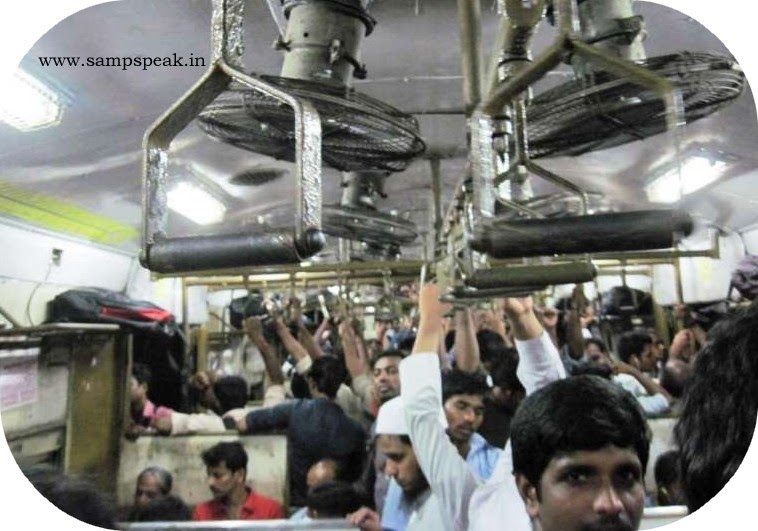 A newspaper report quoting an official from the Mumbai Railway Vikas Corporation justified the hike on the grounds that season ticket holders are paid conveyance amount by their employers. He said, "Why should we subsidize a person by charging only for 15 journeys when he is undertaking more than thrice that number per month?" To the Q why such steep hike now – Indian Express has the answer … it states that the answer to this is contained in the interim rail budget presented this March by predecessor M Mallikarjun Kharge. Calculating this fiscal's earnings targets for the public transporter, Kharge had factored in a hike of 14.2 % in passenger fares and an increase of 6.5% in freight charges in his interim budget this March. For political concerns of imposing the tough decision in the run-up to the general elections, the United Progressive Alliance (UPA) government had not implemented the decision. During Pawan Kumar Bansal's stint in the ministry, the railways had taken a policy decision to charge the Fuel Adjustment Component (FAC) twice a year. The hike indicated by Kharge in his budget speech was due in April this year. Unable to implement the decision because of the election code of conduct, the Railway Board notified the decision on the day of the announcement of the election results on May 16. The notification was promptly withdrawn the same day after a few hours, reportedly because Kharge - who asserted that he continued to be the railways minister on that date - put his foot down. Now BJP Govt has done what was thought to be undoable – a steep hike. Attacking the previous government, Union Minister M Venkaiah Naidu today said the hike in rail fares was “thrusted upon” by the UPA, but it was a “bitter medicine” that had to be swallowed in the interest of sound health of the economy. Naidu explained that only 4,000 out of 12,000 trains announced by successive railway ministers during the last 10 years have been introduced, said the present railway projects need Rs five lakh crores for implementation. Firstpost reports that in Feb 2014 when the UPA was in power, it was the Railway Board which proposed a 5% increase in the freight rates and a 10% increase in the passenger fares. The proposal was to rationalise the freight rates – the proposal was to give the Railways an additional revenue of Rs 7900 crores. The then Prime Minister approved the hike and suggested that both freight and passenger fare should be implemented with effect from 1 May, 2014 itself. The Railway Board accordingly notified this increase on 16 May, 2014 when the Election results were being declared. This decision gave effect to what the Railway Board, the Rail Minister and the then Prime Minister had concurred. The Railway Minister developed cold feet and in the evening of 16 May, 2014, even after the UPA had been defeated in the Elections, he countermanded the order of the Railway Board so that theoretically the decision taken by him and the then Prime Minister is implemented by the Railway Minister of the NDA Government. By withdrawing the countermanding order, the present Railway Minister, DS Sadananda Gowda has taken a challenging decision. The choice before Shri Gowda was whether to allow the Railways to bleed and eventually walk into a debt trap by following the policy of the UPA Government or implement the decision which the UPA Government had taken to increase the fares for both passenger and freight but did not have the courage to implement. A loss making railway will provide below-par services. It will eventually not even have the resources to pay its’ bill. India must decide whether it wants a world class Railway or a ramshackled one. The Railway minister has taken a difficult but a correct decision. The hike — 14.2% in all classes of passenger fares and 6.5% in freight charges — is effective June 25 and will also apply to tickets purchased in advance for journeys commencing on or after that date. The difference in fare for such advance tickets will be collected by ticket examiners during the journey. It applies for season tickets too … and how they would be collected remains to be seen – as, today web searches threw no result on this.